How will combining the randomness of slots and the basic elements of a role playing game turn out? Well, it turned out pretty good. Tower of Fortune by Game Stew has simple gameplay that will keep players entertained. This app requires iOS 4.3 or later for the iPhone, iPod Touch, and the iPad. Risk and reward are things to keep in the back of your mind when playing this game. One press of a button is all it takes to play Tower of Fortune. Press the spin button then press the stop button to see which three icons will appear and what result will occur. The icon on the left will be the only action taking place. Matching two or three of the left icon will produce a stronger effect. Pressing bet will double the result at the cost of one hundred gold while pressing exit will give you a guaranteed escape. There are four areas to play: tower, tavern, treasure, and scum family. The tower is where you will spend most of your time in. 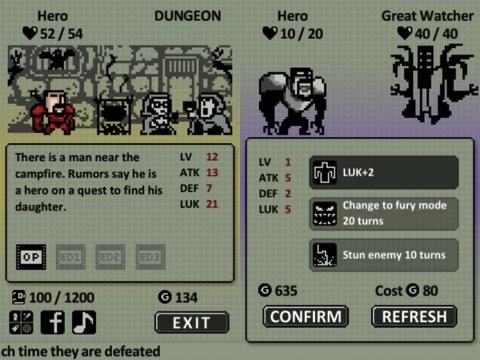 Fight monsters in the tower while trying to complete the quest at the bottom of the screen. Combos are used only in combat and gives you a stronger effect such as getting a sword and sword again on your next spin will let you do more damage. You start off in the root which is free to enter and try to get enough gold to unlock the next stage. Each stage after the root requires gold to unlock and gold to enter. The final area requires three keys to enter which are gained by beating bosses and picking the key as your reward or buying them for one thousand and five hundred gold each. Beating a boss will let you pick one of three items as a reward and they are random until nothing is left but the key. Bosses are stronger than the last time you fight them. Dying happens occasionally and you will lose everything except for the gold you’ve collected. Getting hit by a critical will turn the hero into a muscled out version of himself. He is stronger but fury mode lasts for three turns. When you level up you can choose from one of three random results or use gold to hopefully get new results. Some of these include doing one hundred damage to the enemy, increasing a stat by one, critical damage up by two, etc. I highly suggest getting attack, defense, and fury mode increases. 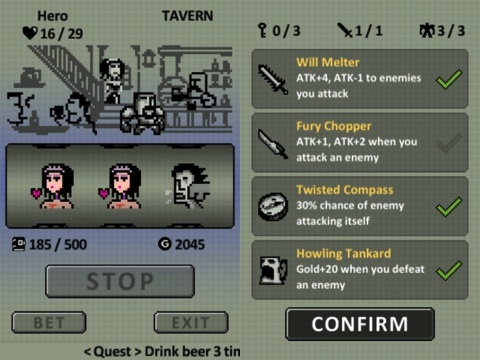 The tavern is where you can heal, increase your health or luck stat, fight in the bar, and/or do a quest or two. Tavern quests are easier than tower quests but you get less xp. The treasure slot gives you gold when you beat an enemy. The scum family slot is playable when you get the dad’s picture in the treasure slot. They take your gold when they hit you but if you can defeat one of the three, you get a nice amount of gold. I was hoping matching two or three scum family pictures will give you more gold. You can check your stats by pressing the campfire. Pressing the sword and shield to change your equipment and see how many keys and equipment slots you have. Pressing the diamond will let you buy things that can help you in battle or to change something in camp. This is also where you can use real money to buy gold to use in-game. I recommend using gold to get equipment slots, in-game items (max of five), the mystic pet, and potions since they give you full health when you die. The graphics for Tower of Fortune reminds me of when Tamagotchi and Digimon were introduced. Tower of Fortune is more polished and has more color compared to the original pet devices. The pixelated graphics are well done. Equipping items will not appear on screen but this doesn’t bother me too much. The game tells you how many potions are left. I like the punch attack when you go into fury mode but it was taken out for more variety but I would like it to be added back in. I also like the brief injections of color when you stop your spin and get a result. The audio fits the atmosphere very well. You can hear and see a storm on the title screen. The sound effects and music are fine to me. The slots and coins dropping remind me of actual slot machines. The sounds of an attack landing are what they should sound like. Some strange things I think Game Stew can fix are not just being able to turn the music off but also sound effects and including iPod music support. Tower of Fortune is $0.99 on iTunes. The goal of the game is to get all three endings. You can replay a stage as long as you can pay for it. The equipment I like are the sword that gives a chance for a double attack, a ring that heals one HP every turn, and the items that helps you get more gold. I replay a stage so I can get all items unless the boss is too strong then I move on to the stage with a weaker boss. There are some problems with the game but they are not that bad to me. I would like the one use items to stay and not disappear after a battle or two. Some quests will not be completed if you don’t have luck on your side such as killing the enemy in one turn. I hope Game Stew will fix this by moving on to the next quest when one can’t be done anymore. I also would like to be able to buy stats after I got all three endings since the bosses get much tougher every time you beat it but this might be too much to ask for. I can see how this game might bore some people but I like Tower of Fortune and I believe it lived up to what it supposed to be. AppSafari review of Tower of Fortune was written by Tony Lau on July 3rd, 2012 and categorized under Adventure, App Store, Featured, Games, RPG. Page viewed 4620 times, 1 so far today. Need help on using these apps? Please read the Help Page.